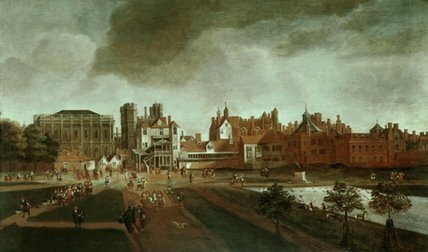 The Old Whitehall Palace by Hendrick Dankerts, 17th century. Before it was destroyed by fire in 1698, Whitehall was the largest palace in Europe, with more than 1,500 rooms. An overflow crowd at the Whitehall Tiltyard watches thirty-year-old Edward de Vere as he once again proves himself a master showman. The spectators gasp as he emerges from his magnificent tent, appearing as the Knight of the Tree of the Sunne. His boy-page approaches Queen Elizabeth and, facing her, delivers a “Sweet Speech” (written, no doubt, by the earl himself). 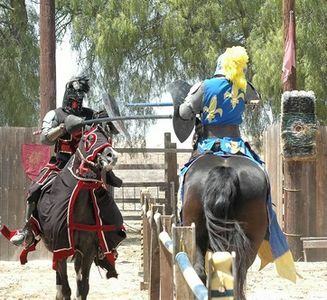 Now, after an exchange with his delighted queen, Oxford mounts his horse and rides to defend his title against the challenger. At the end he is still champion of the tilt; and members of the cheering, frenzied crowd race to tear the tent and the tree into pieces. “By the tilt stood a stately Tent of Orange tawny Taffeta, curiously embroidered with Silver & pendants on the Pinnacles very slightly to behold. From forth this Tent came the noble Earl of Oxenford in rich gilt Armor, and sat down under a great high Bay-tree, the whole stock, branches and leaves whereof were all gilded over, that nothing but Gold could be discerned. 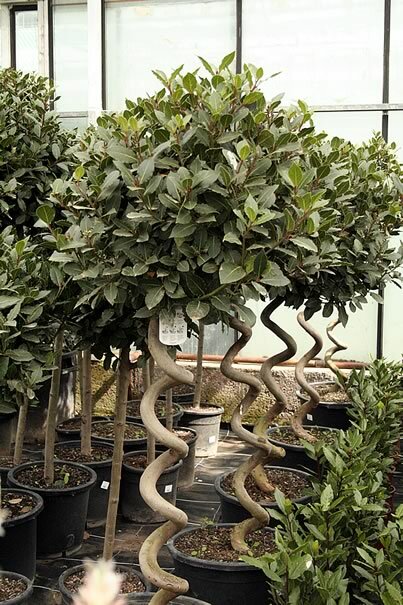 A Bay-Tree, this one with a spiral stem. Bay-trees can grow much larger. “The speech being ended, with great honor he ran, and valiantly broke all the twelve staves. When J. Thomas Looney identified Oxford as “Shakespeare” in 1920, he was probably unaware of this “show” that the earl produced, directed and starred in. But let us imagine Looney making observations and gathering evidence, which would come together as an initial theory of Shakespearean authorship, and then coming upon the above account of an event in Oxford’s life. Isn’t it just the kind of thing he might have expected and hoped to find? 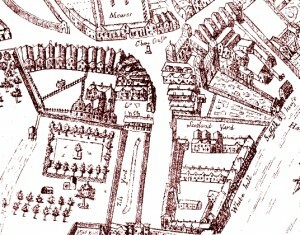 There is a clear link between Oxford’s appearance in 1581 before Queen Elizabeth as “the Knight of the Tree of the Sunne” and the allegorical elegy The Phoenix and Turtle, published in 1601 as by “William Shake-speare” in a compilation of verses called Love’s Martyr or Rosalins Complaint. In his 1581 tiltyard performance Oxford had depicted Elizabeth as the Phoenix, the mythical bird that consumes itself in flames ignited by the sun and is reborn from its own ashes; even earlier, the queen herself had used the Phoenix as a symbol of her chastity and of the rebirth (through succession to the throne) of her Tudor dynasty. Oxford depicted himself as the queen’s loyal knight devoted to protecting “the Tree of the Sunne” — the single (or sole) Arabian tree in which the Phoenix had her nest, symbolic of the English throne and Elizabeth’s dynastic seat. The earl’s page delivered an oration to the queen describing how the earl had made “a solemn vow to incorporate his heart into that Tree,” adding that “as there is but one Sun to shine over it, one root to give life unto it, one top to maintain Majesty, so there should be but one Knight, either to live or die for the defense thereof.” Oxford was symbolically merging with Elizabeth, as if they were a single entity, and pledging to protect the queen and her dynasty with his “constant loyalty” as well as with his life. 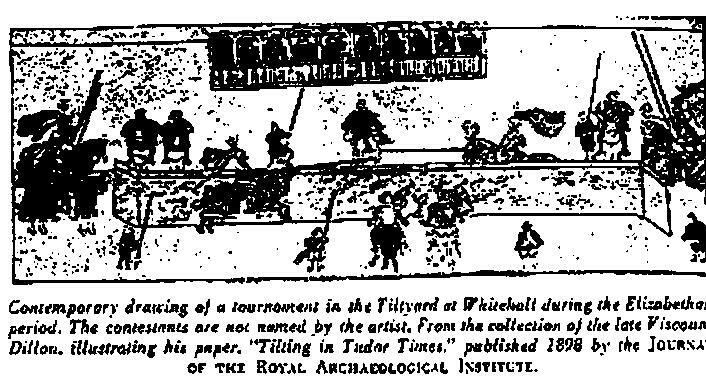 Contemporary drawing of a tournament in the Tiltyard of Whitehall Palace during the reign of Queen Elizabeth, where Edward de Vere was champion of the “solemn joust at the tilt, tournay and barriers” on both occasions when he participated, in May 1571 and January 1581. When J.T. Looney published his landmark book identifying Edward de Vere as “Shakespeare” in 1920, he was apparently unaware of this “show” that Oxford produced and directed and in which he played the starring role. But let us imagine Looney making observations and gathering evidence, which would come together as an initial Oxfordian theory of Shakespearean authorship, and coming upon the above account of an event in Oxford’s life when he was not yet thirty-one in 1581. Isn’t this extravaganza just the kind of thing he might have expected to find? And then, before the dangerous and dramatic real-life action of the tournament begins, Oxford’s page faces Elizabeth and speaks aloud the written oration. In virtually every respect, here is a most wondrous dramatic play, produced by Oxford a dozen years before the name “Shakespeare” will appear in print. Next we’ll get into the Sweet Speech itself; meanwhile, this piece of evidence is No. 52 – Part One of 100 Reasons to believe Oxford wrote the great works attributed to William Shakespeare.